A terrific day of naval heritage, stunning scenery and very high winds on the Orkney island of Hoy! The ferry deposited us at Lyness, which from 1917 was the Royal Navy’s principal base for the Scapa Flow anchorage, home to the Grand Fleet in the First World War and the Home Fleet in the Second. Commissioned as HMS Prosperine, the base became familiar to many thousands of officers and men – probably far too familiar to many of them. Although the day started sunny, the cold wind – and, by mid-afternoon, the lashing rain – gave us at least a tiny insight into what many winter days must have been like for those in the base and those aboard the ships anchored out in the Flow. 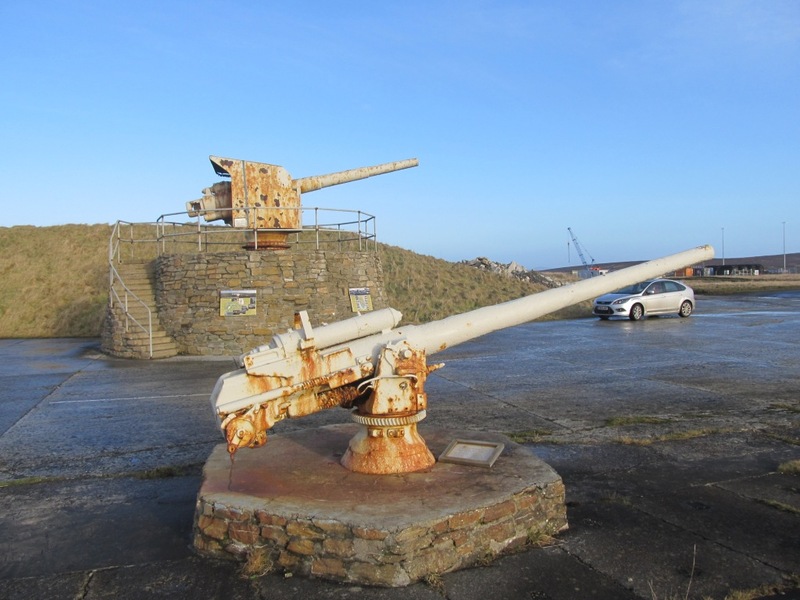 Lyness itself is now a tiny place, but some relics of its naval past survive (much of the base was rapidly demolished after its closure in 1957). One of the sixteen oil storage tanks that once dominated the shoreline still exists, and is now the home of the Scapa Flow visitor centre. Inevitably, this is closed in the winter, but fortunately several large and interesting exhibits are on display outside. These include guns salvaged from the German cruisers Bremse and Karlsruhe, units of the High Seas Fleet that scuttled itself in the Flow on 21 June 1919, and a propellor and shaft from HMS Hampshire, which sank off Marwick Head on 5 June 1916 (see yesterday’s post). Dominating the landscape at Lyness is the vast concrete bulk of the headquarters building erected in 1943; this stands on the hill known as Wee Fea, a terrific viewpoint from which it’s possible to see most of the Flow. The building is a somewhat eerie place which on the British mainland would undoubtedly have been demolished or closed off and plastered with ‘Keep Out’ signs or Health and Safety warnings; as it is, it’s possible to wander through its vast rooms and look out through the windows, imagining the sight of Hood, Nelson or Ark Royal in the waters below. Most people who know anything at all about the naval history of Orkney assume that it’s all to do with Scapa Flow and the two World Wars. In fact, the islands played important parts in naval warfare for many centuries: Haakon IV, King of Norway, returned to Kirkwall to die after his defeat at the Battle of Largs in 1263, and in Britannia’s Dragon, I argue that Largs played an important if indirect part in the loss of Welsh independence, principally because Norse interventions, several of them launched from Orkney, had been important counterbalances for the Welsh princes to deploy against the English. Orkney played relatively little part in the naval history of my principal period, the seventeenth century, although that might have been very different – in 1667 the Danes, who had declared war on the side of the Dutch, began to plan an invasion to reclaim the islands, lost to them in a treaty with James III of Scots in 1469 (which was never meant to become a permanent arrangement). The unexpectedly swift end of the war put an end to the scheme. During the Napoleonic war, though, Orkney became an important assembly point for convoys to the Baltic, which formed up in Longhope Sound. 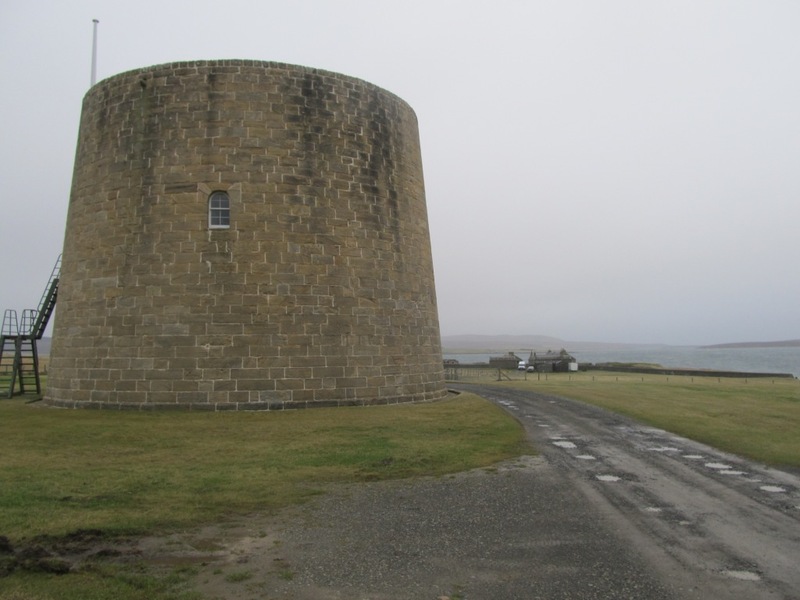 To prevent depredations by French and American privateers, a Martello Tower and battery were erected at Hackness Point in 1813-14, with a second Martello on the opposite shore at Crookness. We also went to Hoy Church, at the opposite end of the island to Longhope, which has an altar formed of wooden panels allegedly taken from a Spanish Armada wreck, although the later carvings and date ‘1624’ suggest that this might be a local myth. 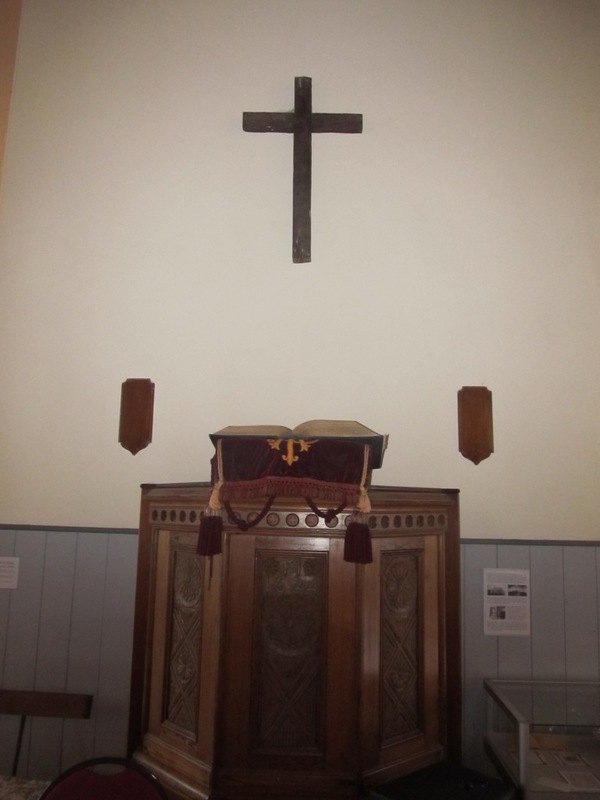 However, above the altar hangs a wooden cross made of wood from the wreck of HMS Vanguard, a Dreadnought battleship which was destroyed by an internal explosion off the island of Flotta on 9 July 1917. Incidentally, Hoy Church was a very welcome find: it’s now run as a local community centre and archive, is kept open even at this time of year, and provides tea and coffee on an honesty basis, as well as having some fascinating information about the local area on display! A big thank you to the local people for providing such a delightful facility. It’s sad that more churches elsewhere in Britain don’t do something similar, but alas, other parts of Britain don’t always have the strong sense of community and lack of anti-social behaviour which allows Hoy to open when so many thousands of other churches stay locked. Hoy Church is fairly close to Rackwick, a remarkably beautiful scattered community of tiny cottages on a storm-wracked bay surrounded by towering cliffs. It was founded by Covenanters escaping a shipwreck when on their way into exile in 1679, but now seems to consist principally of empty holiday homes and isolated retreats for hippies, eco-warriors and (up until about 15 years ago) the Master of the Queen’s Music! 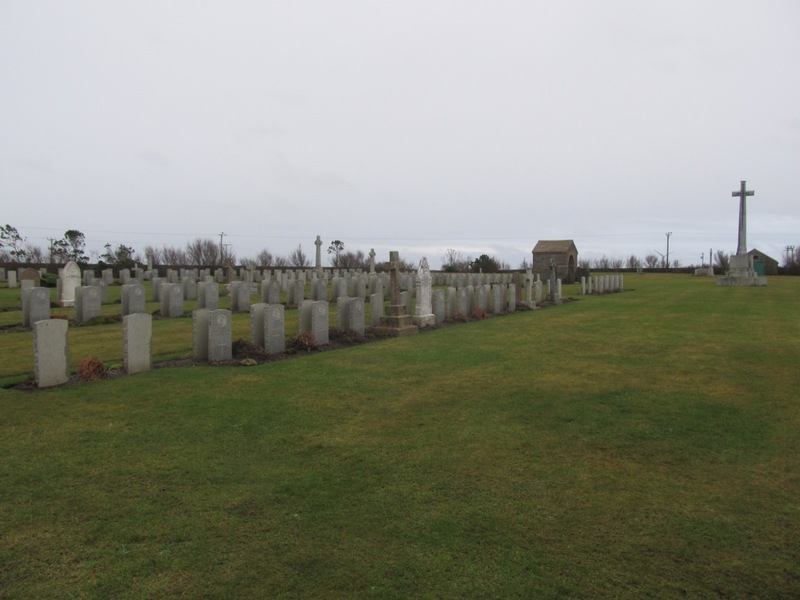 Our final port of call before taking the ferry back to the Orcadian mainland was Lyness naval cemetery. This has similarities to the Commonwealth War Graves Commission cemeteries on the Western Front and elsewhere: the cross of sacrifice, the serried ranks of immaculately maintained gravestones, and so forth. But it also has vast empty spaces, suggesting perhaps that those who originally conceived it in 1915 expected it to contain the many casualties of the several great set-piece battles that they anticipated but which never happened, and that those who maintained it after 1945 perhaps anticipated that Scapa would again come into its own during a Third World War. There are entire rows of graves from some of the Royal Navy’s worst naval disasters – the Vanguard explosion, the loss of the Hampshire, and the sinking of HMS Royal Oak by U-47 in the Flow itself on 14 October 1939, an incident which caused Churchill to order the sealing of the eastern channels into the Flow (of which more later in the week). There are also poignant memorials to those from other lands, including several rows of German graves and the isolated stones marking the last resting places of three Muslims and a Parsee. Perhaps incongruously, though, I was also struck by the adjacent gravestones of two men who perished in the disastrous collision between the destroyers Opal and Narborough on 12 January 1918. One bears the correct spelling of the name of the seventeenth century admiral Sir John Narbrough, whose career I’ve studied in detail (including writing his entry in the Oxford Dictionary of National Biography); the one immediately adjacent to it uses the incorrect spelling used by the Admiralty in naming the ship and by the carvers who provided all the other headstones to the dead of her ship’s company. All in all, our day on Hoy proved to be a memorable one. Tomorrow we’re flying over to Shetland for the ‘Viking’ fire festival of Up Helly Aa, so blogging will resume later in the week! Orkney became ‘Scottish’ on 8 September 1468, Shetland in 1469. Phew, you’ve certainly crammed a lot in. I really envy you Up Helly Aa – have lots of fun.